Glass shelves for bars add to any décor. Glass shelves for bars add sparkle and glow to your exciting bar display. Our glass bar shelves are excellent for a home bar or restaurants and pubs. All of our glass bar shelves are 3/8” thick. In stock sizes are 4 ¾”, 6”, 8”, 10”, and 12” deep. Our in stock lengths include 12”, 14”, 18”, 24”, 30”, 33”, 36”, 42”, and 48”long. 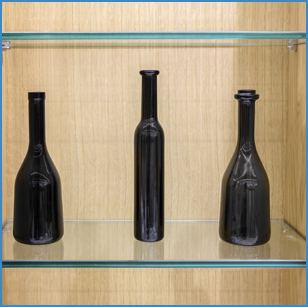 Using these in stock sizes will save you more than ½ of what you would pay for custom glass shelving. Our 3/8” thick glass bar shelves have a bright flat polished edge with touched corners. Your Glass shelf is tempered at NO ADDITIONAL COST. Tempered glass is 4-5 times stronger than standard annealed glass. Tempered glass is manufactured through a process of extreme heating and rapid cooling. Tempered glass shelves are more heat and scratch resistant than standard annealed glass shelves.